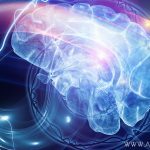 Clairaudience - 6 Simple Ways to Boost your Clairaudient Ability Today! Clairaudience is the psychic skill and ability of hearing. Specifically, it’s hearing beyond the physical into the higher realms and dimension of existence. It’s hearing the guidance of your Angels and messages from the Ascended Masters. Clairaudience even includes the insights, guidance, and wisdom of your higher self and your intuition. 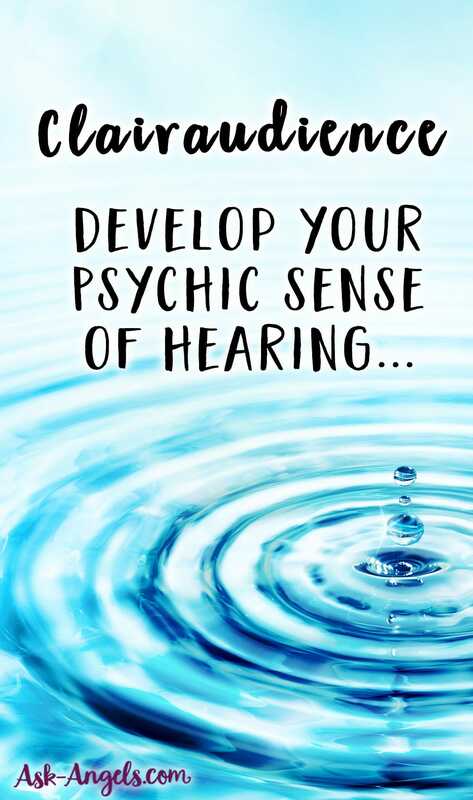 In today's day and age, clairvoyance is a huge buzz word and the psychic gift everyone wants to develop… But perhaps even more powerful, or at the very least, powerfully supportive is clairaudience… The psychic gift of clear hearing. In other words, people who have developed clairaudience are able to receive spiritual guidance, messages from their spirit guides and angels, and information from beyond the physical through the subtle psychic sense of hearing. Surprisingly, many people are clairaudient without realizing it! This is largely due to their expecting clairaudience to work differently, or come on in a way that's stronger than it is currently manifesting. Even if you don't think you're clairaudient, hearing the messages of angels, and the guidance from spirit is possible for you because clairaudience can be developed! You know that quiet voice in the back for your mind which encourages you, offers a warning, or new perspective? This is clairaudience! If you like this video, check out my YouTube Channel here! Hearing the guidance from spirit usually starts as an internal voice and one that many people mistake as their own. However, that small inner voice of love, encouragement, validation and guidance, may actually be your Higher Self, your Spirit Guides, or Angels guiding you forward on your path. Many people are clairaudient without realizing it. We expect this psychic sense to operate in a way that's more drastic and pronounced. We expect to hear in the same way we hear when we talk to each other. The reality is that clairaudience can happen by external hearing, but more often than not it unfolds through an internal voice. This is especially true when you're first becoming clairaudient and opening your gift. It's not just hearing your own thoughts, but rather hearing the guidance of spirit in an internal voice. How do you boost your ability to psychically hear? Quite simply, raise your vibration! Increasing your vibrational frequency is a wonderful way to increase all of your psychic senses. When you become a vibrational match with the teachings, insights, and love of your higher self, the Ascended Masters, and the Angels, you're able to tune tune into them! By raising your vibration, you’re naturally in closer alignment with the Angelic and higher realms. This makes it easier for you to hear the guidance, messages, and support available to you right here and now. One of the simplest ways to raise your vibration is to pay attention to what you're putting into your body. Make sure you're preparing your physical vessel for this higher vibration with healthy food and water. Including plenty of fruits and vegetables! Next, actually fill yourself up with more love and light. You can do this by asking your Angels to help. Imagine light all around you and call in the presence of your Guides and Angels. Know that when you ask, your team in spirit will absolutely help. Learn 9 more ways to Raise Your Vibration to boost your clairvoyance here! 3. Meditate to Boost Your Clairaudience! You knew this one was coming right? Meditation really is an essential tool in developing clairaudience, and all of your subtle psychic senses. 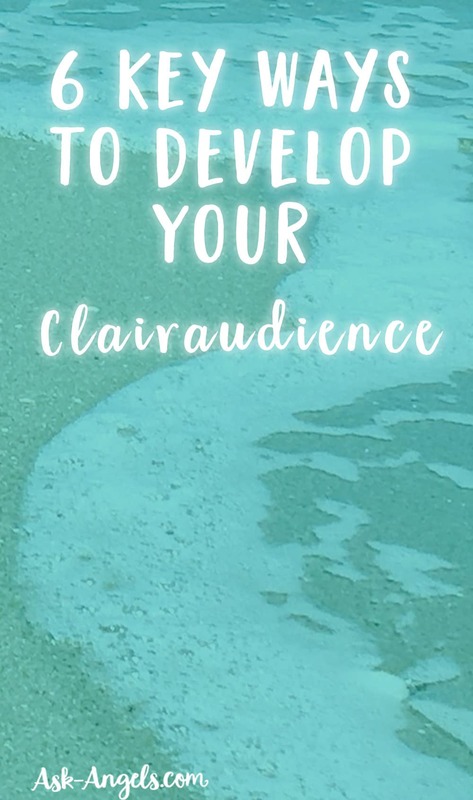 Clairaudience often works as an internal voice. It's important that you quiet your own internal voice in order to hear. Your Angels are speaking to you, but if your mind is running in a loop of limiting thoughts, worries, and beliefs, that rises to the surface and blocks out your ability to hear in spirit. This is why meditation is so key for opening all of your psychic abilities – and your clairaudience specifically. Quiet your mind, open your heart, and tune into the light around you. Ask your Angels for help from an elevated place of vibration with a clear mind and an open heart. You have created the space to receive clairaudient information and to receive Angelic guidance. Meditation may seem challenging at first, but keep practicing. Try guided Angel meditations through simply sitting and focusing within or on your breathing. Try meditation walks or heart breathing. These will support you in learning to quiet your mind and become open and receptive to hear in the higher realms. When your mind is clear and calm, you are in a state of allowing spiritual guidance to appear. Practice quieting your mind, opening your heart, and simply being present and aware in the moment. When you’re able to easily do this, you can start asking a question before or during your meditation. Ask your angels and spirit guides anything you’d like… And then quiet your mind, and listen for your inner voice of wisdom to appear. Don’t try to force insight to happen, just be, breathe, and listen. The guidance from your angels may come in many ways, and you may begin to hear a sound, a song, or a message relayed through your inner voice of clairaudience. 4. Listen to Become More Clairaudient. A great way to start developing your clairaudienceis to become a better listener in general! Fully listen to others when they are speaking to you instead of thinking about what you’re going to say next. Quiet the internal voice that wants to respond. Be present, open, and receptive to what other people are saying. This is the same way you listen in order to receive the clairaudient insight from spirit. Listen to your breath flowing in and out when you are meditating. Listen to the sounds around you when you lay down to sleep at night, or the sounds of nature when you’re outside. Listen so you can clearly hear! You have to quiet the voice of your ego mind to become aware of all the sounds happening around you. When you quiet your mind and listen, you are naturally going to be more receptive to hearing the guidance of spirit as well. 5. Imagine You're Powerfully Clairaudient. A great way to understand how your clairaudient sense works is to imagine hearing… Imagine you're clairaudient! This simple exercise is a workout to develop clairaudience, and it will make it easier for you to hear spirit in the future. Practice imagining sounds until you can clearly hear them in your mind. Notice how your inner voice sounds and where in your mind these sounds are located. Sit with your eyes closed and call in your Angels. Imagine light all around you opening your heart and expanding your energy body. Then imagine you’re hearing into the Angelic realm. What does the tone sound like? Is there a melody or a musical vibration? Now imagine this with your internal hearing sense. If your ego mind chimes in that you don't know what that sounds like, it’s okay to shift. Imagine hearing a stream flowing through the forest or the sound of waves crashing onto the shore. Listen with your internal voice to the sound of birds chirping or any other sound you can think of. Just practice listening for it and hearing it internally – rather than externally. This is going to support you in opening your psychic sense of clairaudience by making you more aware of how you receive audible information internally. You can also do this by finding a quiet place to sit, and simply imagine you’re hearing…. …Feel free to add to this list! 6. Ask the Angels For Help! When you ask, be sure to act upon the intuitive guidance you receive. Respond to information about changes to make in your habits or dietary choices. Respond to nudges to implement practices like yoga or meditation. Quiet your ego mind, raise your vibration, and expand your light. An open heart and an expanded consciousness opens your subtle psychic senses and so much more. Ask your Angels to help and then let go of the outcome. Surrender the outcome to divine will and just let yourself be open, receptive, and willing to take steps to raise your vibration. 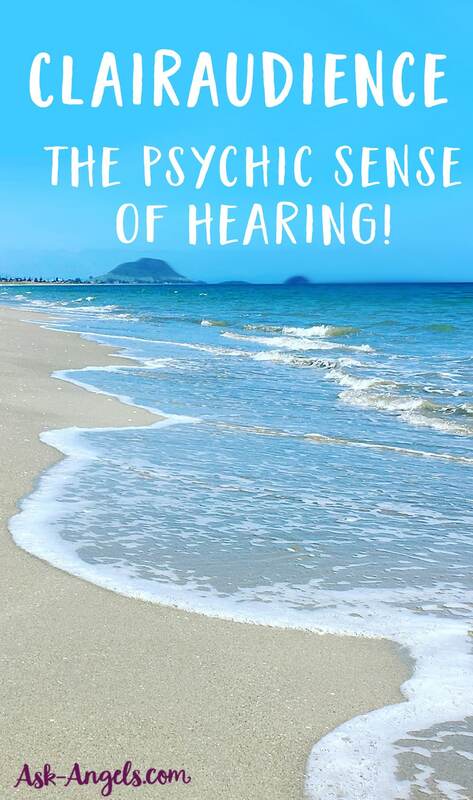 Practice, listen, and focus on your psychic sense of clear hearing that is available to you here and now. When you ask for help, listen for guidance. Trust that guidance and act upon what you receive. Keep taking steps to stand in your full authentic light. Let your vibrant spirit shine because this raises your vibration and brings your psychic gifts and ability into the present moment here and now. Clairaudience is such a beautiful gift and a way of experiencing the spiritual realms. Give these practices a try. Keep in mind that developing clairaudience or any psychic sense takes practice. Be patient with yourself, relax, and have fun with it. Clairaudient is a beautiful gift allowing you to hear the higher realms of love. Ask Archangel Michael to protect you and cleanse your energy as you clear your mind, surround yourself with light, and refocus on love. P.S. Ready for more? To learn how to develop all your psychic senses… Clairvoyance, clairsentience, claircognizance and clairaudience… Click here! There's More to Your Gut Feeling… Clairsentience! I , last night awoke fully conscious and heard a female voice say “Hello”. It was as clear as if on a telephone. I believe I had a spirit guide up until the age of seven. He showed me great philosophy and spoke to me in what today would be an archaic 19th century style. Since I now am 73 and may have limited time left in this plane, I mediate regularly and ask my guide to help me become more in spirit. To be less of self and more of other. Back in 2004 when my second son was born, I was in the hospital room, and I awoke to the sound of Gregorian chanting in the middle of the night. I got up from my bed and walked around the room, trying to figure out the source of that music. I was so perplexed as to WHY I was hearing music playing softly in the room. I heard it again in the second night. Fast forward to August 2017, I was back in the hospital with that same son, this time after his emergency appendectomy. I had thought about the chanting I heard before, but when I remembered it this time, I had a name to put to the experience. My spiritual awakening started in April 2017, so now the whole experience makes so much more sense. 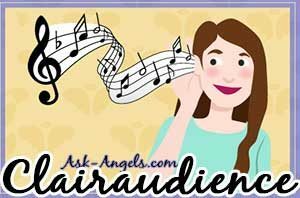 Thank you so much for this Ask-Angles.com, the suggestions to work on clairaudience, and all information you provide. It is just the thing I need as I navigate this exciting yet overwhelming journey that I am now taking! Much gratitude to you! My gift is when texting or reading and when someone is talking, I hear the voice like they are talking to me; I feel their emotional state and can tell if they are using a mask to disguise themselves. I actually hear the person talking behind a mask, like it muffled. Please help me to listen to all the beautiful sounds around me. Bless me with protection from arch angle Michael. Meditate on good positive vibrations.Help me to welcome messages from my angles clear and sound. Give me sign as to what I should be doing. I read this & I really find it so amazing!! Thank you for sharing this with me & so many others, God Bless You!! You’re welcome! Thanks for commenting…. many blessings! Thank You so much Melanie, for share with us. I apreciate from the bottom of my heart all the información all the meditation You are a special and wonderful person. God Bless You. So glad to hear… Thanks for commenting! Thank you for your help in my journey. I’m so grateful for your postings and instruction!! Blessings and Light to you. So glad to hear this was helpful for you… Blessings of love and light flowing back your way! Yes I have this experience when I meditating and recit mantras Thankyou. Beautiful, you’re creating a space in your normal thinking mind for your clairaudience to appear… Thanks for sharing!